Although it’s often associated with older patients, glaucoma affects more than 3 million Americans of all ages, ethnic background, and lifestyles. People come to Four Corners Eye Clinic for glaucoma diagnosis and treatment from Colorado, New Mexico, Utah, and Arizona performed by our fellowship-trained glaucoma specialist, Dr. Joshua Zastrocky. “Glaucoma” is a general term that is used to refer to a group of eye diseases in which the eye’s optic nerve is damaged. This results in a characteristic pattern of vision loss. 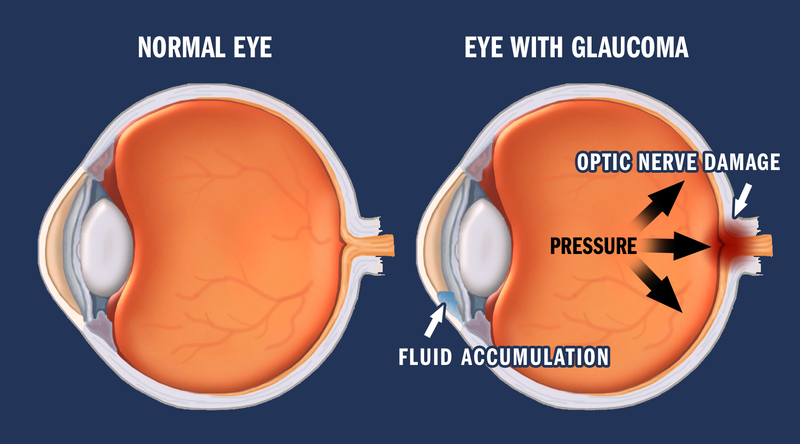 Elevated pressure in the eye is a primary risk factor for glaucoma, but up to one-third pf people with glaucoma have no history of elevated eye pressure. The anterior chamber of the eye is filled with fluid that continually flows in and out through the open angle where the cornea and iris meet. Normally, your eyes self-regulate the amount of pressure inside through this drainage. Glaucoma results when the eye is susceptible to optic nerve damage, for various reasons, at the given level of pressure. Over time, this can cause serious damage to the optic nerve, eventually leading to permanent loss of vision and even blindness. Open-angle glaucoma: This form of glaucoma is the more common one and typically comes on quite gradually. Over time, the affected eye gradually loses vision due to ongoing optic nerve damage. There are usually no symptoms until the disease is quite advanced. Angle-closure glaucoma: This is a less common form of glaucoma and can be chronic or acute. Chronic angle closure glaucoma behaves very much like primary open angle glaucoma with gradual optic nerve damage occurring without symptoms. Acute angle closure glaucoma results from a sudden blockage of the eye’s drainage system, leading to very high eye pressure. This can result in very rapid loss of vision as well as pain, nausea, and vomiting. This form of glaucoma requires immediate medical attention. A minority of patients experience low tension glaucoma, which is damage to the optic nerve even without increased eye pressure. In such cases, the optic nerve is less tolerant to pressure than normal. Another rare form of glaucoma is congenital glaucoma, in which children are born with a defect in the angle of the eye which impairs drainage. Initially, the more common forms of glaucoma may not cause any symptoms at all. This is partially why it’s important to have regular eye exams even if you’re not experiencing any symptoms. By detecting glaucoma before it causes visual disturbances, we can treat it and prevent vision loss. The earliest and most common symptom of glaucoma is a change in your peripheral vision. Are you caring for someone with glaucoma? Visit our Eye Care for Your Loved One page. Medicated eye drops: Prescription eye drops can help to regulate the amount of fluid in your eye to maintain a healthy eye pressure. Laser procedures: Depending on the severity of your condition, your physician may recommend laser surgery to help open the drainage passageway of your eyes. Minimally invasive glaucoma surgery (MIGS): This group of procedures is less invasive than traditional glaucoma surgery and may be a good option for certain patients. MIGS procedures are generally less effective in terms of pressure lowering than conventional glaucoma surgery. Conventional glaucoma surgery: This would include trabeculectomy as well as implantation of a tube shunt. Although this is the most invasive option, it’s also the most effective in terms if its ability to lower pressure. Permanent shunts in the eyes can keep the drainage systems functioning properly. What Happens During Glaucoma Surgery? The steps of your glaucoma surgery will vary based on the type of glaucoma you have, as well as the type of procedure you undergo. If your doctor has recommended you for glaucoma surgery, whether MIGS or conventional treatment, here’s what you can expect. Trabectome: A trabectome is a very small device that works with your eye to improve its natural drainage processes. CyPass®: This micro-stent, manufactured by Alcon, has been extensively studied and shown to reduce intraocular pressure for years by redirecting draining of aqueous humor. iStent®: This innovative stent can reduce intraocular pressure and has the potential to reduce the need for certain glaucoma medications, too. A MIGS technique is not always appropriate for everyone, and is typically more effective in less advanced cases of glaucoma. During a MIGS procedure, your doctor may place a very small stent through a micro-incision within your eye to aid drainage and preserve your vision. A MIGS procedure is faster than traditional glaucoma surgery and often results in a quicker recovery. MIGS combined with advanced cataract surgery can effectively lower intraocular pressure and improve vision while reducing dependence on glasses and contact lenses. Trabeculectomy is the most common, and most effective, form of conventional glaucoma surgery. During this procedure, your surgeon makes an incision on the conjunctiva, which is the mucous membrane that covers the eye. He or she then uses a special technique to improve drainage from your eye, reducing eye pressure and slowing down the loss of vision. During your procedure, your eye is fully anesthetized, and you are sedated so that you remain safe and comfortable throughout the entire procedure. You will need a trusted adult to drive you home. After your surgery, your eye will be covered until your anesthesia wears off. For the duration of the healing process, you’ll need to wear an eye shield while you sleep to ensure your eye heals undisturbed. At Four Corners Eye, we’re proud to have the only fellowship-trained glaucoma specialist in the region on our staff. Dr. Joshua Zastrocky has undergone extensive training in the diagnosis and treatment of glaucoma, making him a uniquely qualified choice to help preserve your vision. Dr. Zastrocky is a participating provider in AGS Cares, a public service of the American Glaucoma Society Foundation, that provides surgical glaucoma treatment at no cost to qualifying patients. Learn more about saving your sight and treating glaucoma today. Even if you aren’t experiencing symptoms, request an appointment online or call Four Corners Eye Clinic at (970) 259-2202 to schedule your visit. We have locations in Durango, Cortez, and Pagosa Springs, CO, along with Farmington and Aztec, NM. Learn more about World Glaucoma Week 2019 at Four Corners Eye Clinic by clicking on the above image. A board-certified glaucoma specialist, Dr. Zastrocky has spent much of his professional life researching and mastering treatments for this common condition. After graduating, he trained with leaders in the field at the University of California, Davis, medical center. He's pleased to bring those skills to patients at Four Corners Eye Clinic. Dr. Zastrocky is a Colorado native, and he and his wife are happy to raise their 7 children in his home state. Board certified in ophthalmology since 2001, Dr. Meyer is an experienced specialist and genuinely enjoys educating and caring for patients. A Minnesota native, Dr. Meyer has trained at clinics in Milwaukee and Pittsburgh before finally settling in Durango in 2001. In his spare time, he's an avid outdoorsman and understands the role that healthy vision plays in the Four Corners lifestyle. Although Dr. Teel offers a variety of eyecare services, she's Four Corners' go-to for diagnosing and treating retinal diseases. She's a member of the American Society of Retina Specialists and is especially adept at treating retinal detachment, diabetic retinopathy, and other retinal conditions. Dr. Teel also has a passion for serving the medical needs of the larger global community and has worked in Africa and Asia. Outside of the office, she loves spending time in the great outdoors with her husband. Dr. Brach completed medical school with honors and went on to train at the world-famous Mayo Clinic in Minnesota. While Dr. Brach is a well-rounded ophthalmologist, he’s particularly interested in cataract surgery and comprehensive eye care. A native Coloradan, Dr. Brach enjoys the outdoors with his wife, their son and an adopted canine. As a board-certified ophthalmic plastic surgery specialist, Dr. Bishop offers both cosmetic and medical eyecare to the diverse people of the Four Corners region. A graduate of Oklahoma State University, he also works as a clinical professor at Denver Health. Dr. Bishop's years of experience make him a seasoned authority on the diagnosis and treatment of eye disease.